Under California State law (Prop 13), real property is reassessed only when a change-in-ownership occurs, or upon completion of new construction. Except for these two instances property assessments cannot be increased by more than 2% annually, based on the California Consumer Price Index. The property tax rate is 1%, plus any bonds, fees, or special charges. This amounts to about 1.25% of the purchase price. As a general rule, you can calculate your monthly tax payment by multiply the purchase price by .0125 and dividing by 12. For example, if you purchase a $500,000 property, the taxes will be around $520 per month. Unlike some other states, different cities in California do not have tax rates that differ greatly. One major difference in California is that taxes go up only 2% a year, for as long as you own the home. It is possible to save on costly penalties if, prior to your purchase, you make sure there are no prior delinquent taxes due on the property, and if there are, pre-arrange whether you or the seller is going to be responsible for payment of amounts due. At Dannecker & Associates, we always research title to make sure you have a clean title at settlement. If property is purchased in November, determine who is to pay the first installment due on or before December 10 for the period of July 1 through December 30. 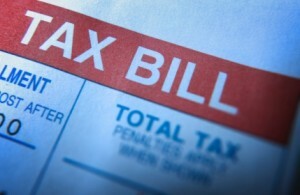 September – Original Secured Property Tax Bills mailed out. November 1 – First installment due (Secured Property Tax) and delinquent Unsecured accounts are charged additional penalties of 1½% until paid.